Here is the Wednesday DT reveal from Heartfelt creations Design team. This is a special LO as my daughters best friend had a very unexpected pregnancy and she did not find out until quite late on. Everyone was very unsure and lots of big changes followed. The outcome was a beautiful baby boy and as you can see from the total look of love on his father's face ...it was all meant to be. Little Jax is safe in his father's arm and the world is good. Light grey and white bazzill, thin white cardstock, Ink Versamark Onyx Black and Versamark clear ink, clear and white opaque embossing powder and heat gun and sewing machine and thread. 2. Stamp HCPC 3588 Vintage Closet Collage PreCut Set numerous times onto left hand third of light grey bazzill clear Versamark ink and heat emboss with white embossing powder. (Use the photo as a guide). 3. Cut out 6” x 6” frame from the paper collection. 4. Machine sew photo into position. 5. Cut a series of 2”, 1” and 1/1/2” strips and lay under the photo as shown in the image. Cut a lizard tongue onto the fattest piece. 6. Trim a decorative circle and lie under the photo mat. 7. Stamp the test in black ink, clear heat emboss and trim. 8. Die cut the square HCD 743 Raindrops on Roses Die. 9. Assemble as shown in the photo. 10. Finish with a hand folded origami bow from 6 x 6” paper. 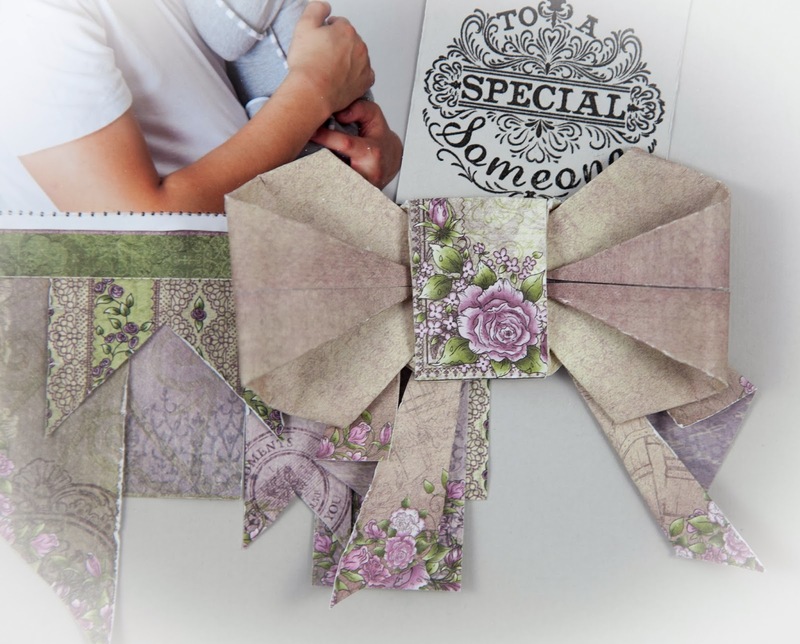 See my blog for instructions to make the bow. Stunning Jenny!! I love that bow you made and what a beautiful baby. What a precious layout! I love the way you stamped and embossed on the left side of the paper....so clever! And all those beautiful banners under the photo draw my eye right to that sweet photo. You are just amazing!